This was super fun! Tawana was referred to me from a previous bride. She doesn’t live in Georgia but she was coming into town for my other client’s wedding so she decided to meet with me right after landing and before all the festivities started. She felt comfortable with me and she was very interested in a passport invitation. 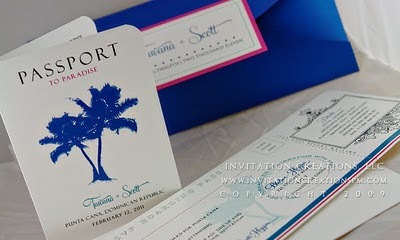 Initially all she was interested in was a passport invitation and an rsvp card. Though I hadn’t created a passport invitation at that point, I showed her the boarding pass invitation that I had done and we discussed how I could alter it to what she wanted. She loved the sleever and wanted to upgrade to include that in her invitations. Pleased with everything she had seen and heard, she chose her papers and everything else was done via email and telephone. We made the boarding pass her rsvp card. 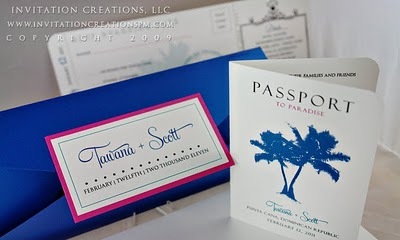 The passport contained some details about their wedding and the official announcement.I LOVE the blue sleeve and her fuchsia just pops off of it. Thanks Tawana for trusting me and allowing me to design such fun and beautiful invitations for you! Annika Matos - Hi there! I just got engaged and really love your passport design for the invitation. Can I get a quote for around 100-150? I’m also a graphic designer so do you also offer options of submitted designs to cover printing only? If so, could you provide the difference in rates? Thanks!